Thursday was day 6 of our Florida vacation and it was kind of the best. It was a "rest" day for the kiddos and they hung out with their grandparents for the day. The hubs and I got to spend the WHOLE day, just the two of us, at Universal Studios. We only had the one day to do both parks, so it was nice to skip the kid rides and get straight to business. 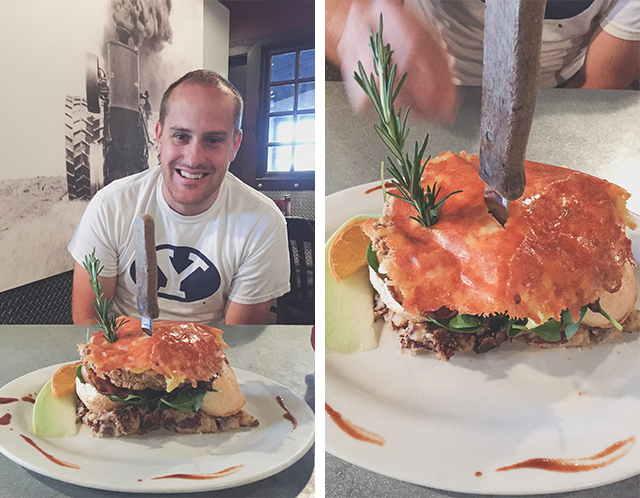 We started out our morning by eating breakfast at Hash House A Go Go. Let's just talk about this for a second... or months... or years because this is a top-notch restaurant. The waiter told us the portions were big, like HUGE big, which led us to sharing a meal (which we never do... see I have this problem with sharing food). We order their Country Fried Chicken Eggs Benedict. If you know me, you'll know that one of my absolute favorite foods is Eggs Benedict. When you come across a menu item that is your favorite thing + fried chicken + griddled potatoes + homemade biscuits + tomatoes + spinach + bacon + eggs + cream sauce... you have my heart. FOREVER, and ever! It came with a chipotle cream sauce, but I hate chipotles so the waiter brought out bowls of their 3 cream sauces. My favorite sauce was their BBQ cream sauce. You guys, my mouth is watering over this right now. Needless to say, it was pure heaven on a plate, more than gigantic and filled us to the brim. AND, and, and!!!! They have a Hash House A Go Go in Vegas (TWO actually). Bless my heart. After filling ourselves, we headed over to Universal. I love the set-up they have because they have a mall-like area as you walk to the entrance - shopping, restaurants, movie theater. It made it fun to walk through these shops. We started in Universal Studios. The new Despicable Me Minion Mayhem ride had a really short line, so we took full advantage of that. BEST RIDE! Okay, maybe second best ride. Later we went on the Hollywood Rip Ride Rockit, which was a little rough and I probably shouldn't have gone on that. 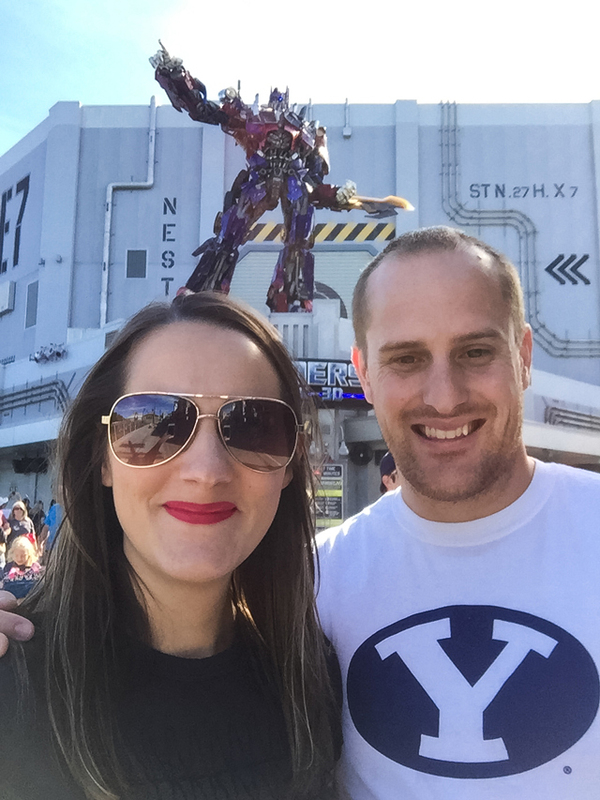 Our FAVORITE ride was Transformers! So neat! Universal has a lot of 3-D rides, which is unique, but exciting. 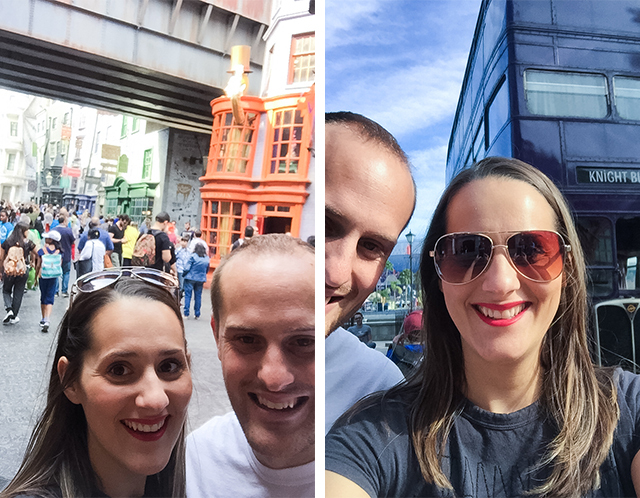 And then, there was Harry Potter World.... HARRY. POTTER. WORLD! Oh, it was perfection! 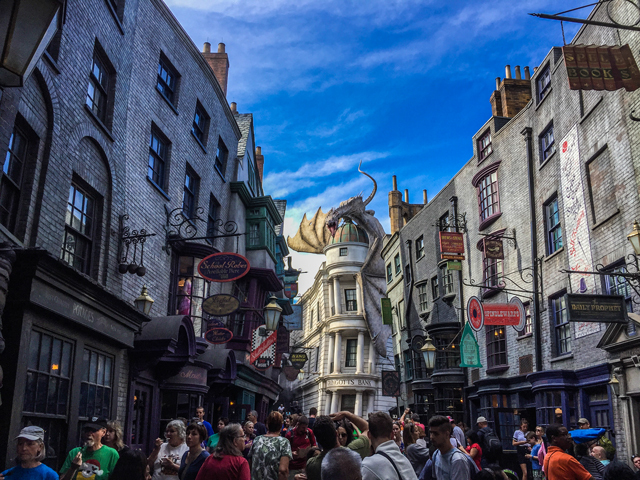 PER-FEC-TION... Diagon Alley is just like the movie. Everything about it. There isn't a lot to see, except that you want to pack up and move in. The Gringotts ride usually has 1+ hour wait, but we only waited 20 minutes or so. Everything about it was magical (no pun intended). 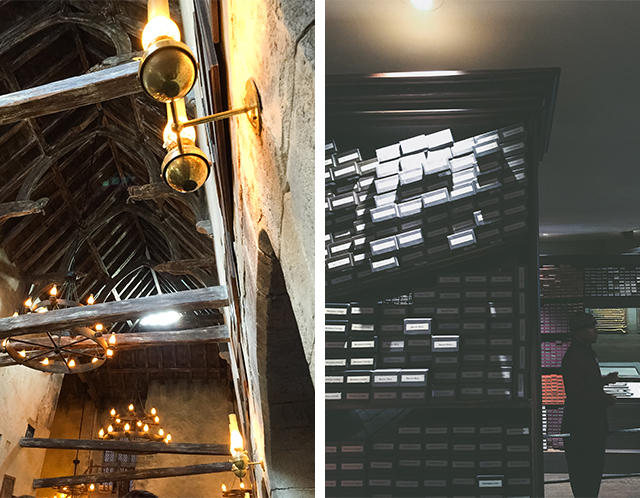 Before our trip, I researched the places to eat (of course) and read that The Leaky Cauldron was the best place to eat. It had a really good menu and I wanted to try everything. I ordered the Fish N' Chips with Pumpkin Juice and AJ ordered a Chicken Sandwich with a Butterbeer. Soooooooo good! I know, Pumpkin Juice sounds weird, but it is yummy. It's kind of like iced Apple Cider, but a little more rich. 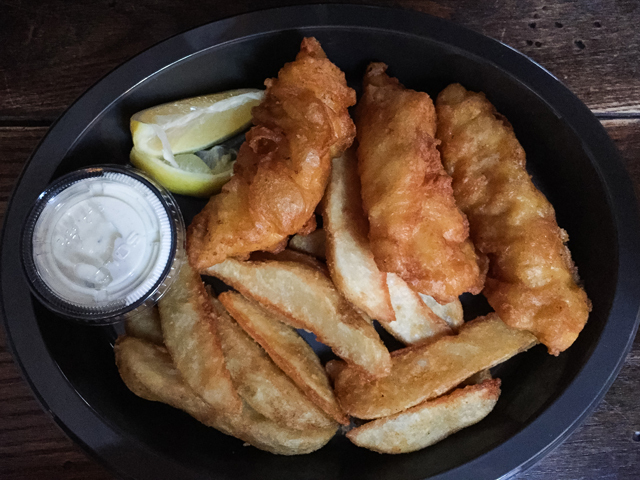 Plus, they have the real kind of Fish N' Chips and even have Malt Vinegar on the table. Again, my mouth is watering. I was also told that the Cottage Pie was delicious too. After eating (and never wanting to leave) we stood in line to ride the Hogwarts Express. Long story short, one of the trains broke and we waited for way too long. It ruined the Hogwarts Express experience for me. Plus, they treat it like a ride, not just a train ride from park-to-park, which was fine, but disappointing. 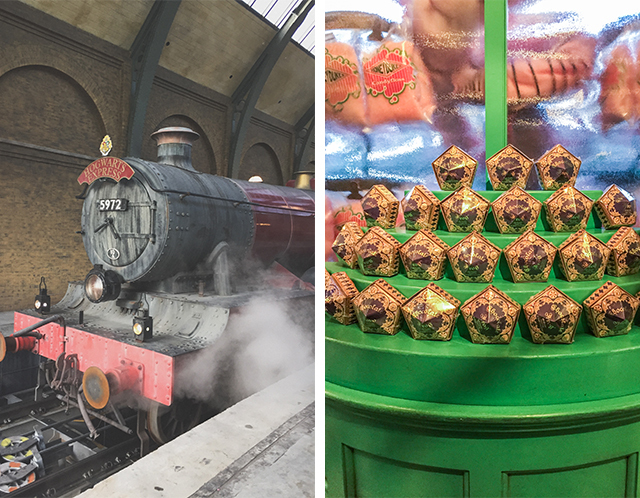 I've heard that the Hogwarts Express is a favorite for some, but not with us. 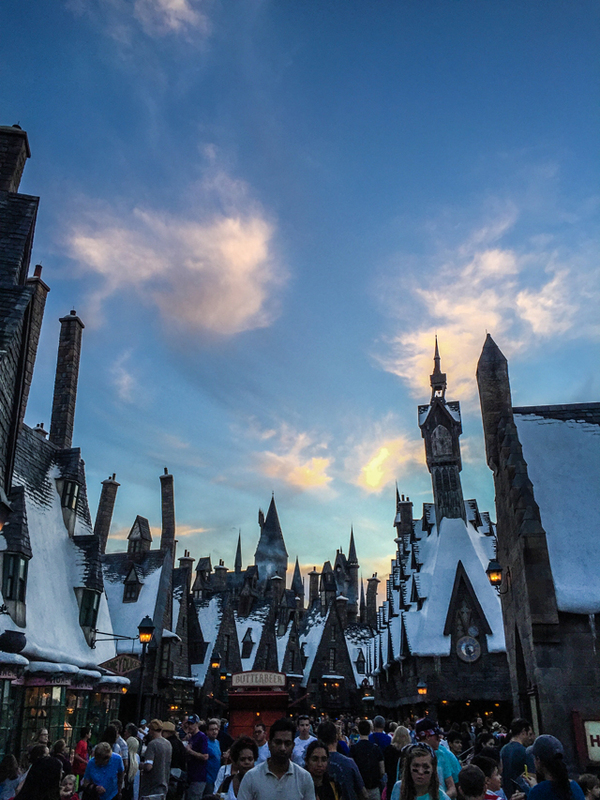 At Univeral Studio's Islands of Adventure, we toured around Hogsmead for a while. The rides there are really the best! 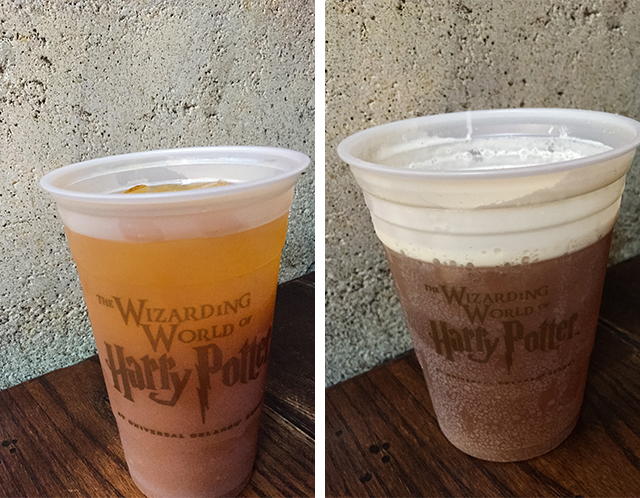 But, after another Butterbeer and roller coaster, we were worn out for the night. We decided to leave early and make our way slowly out of the park, while also stopping to buy some souvenirs for my siblings. We may have stopped at Cinnabon too. What is it with me + vacations + food?? It was absolutely the perfect day, so much goodness packed in those 8 hours. Universal Studios is definitely a must if you have older kiddos. And, the California Harry Potter World opens April 2016. As long as those Fish N' Chips and a glass of Pumpkin Juice can be purchased, I will definitely be fighting those crowds.